Having recently come off of a two and a half month spending ban, I'm sure some of you were expecting this post! I have definitely treated myself following the ban, but this is with some of the money I have saved over the last 75 days. I don't *intend* to buy any more beauty products this month because a) I have bought pretty much everything from my spending ban wishlist and more importantly, b) I can't really afford to!! Now I really want to save up to eventually treat myself to a MAC Pro Palette and three or four eyeshadows. 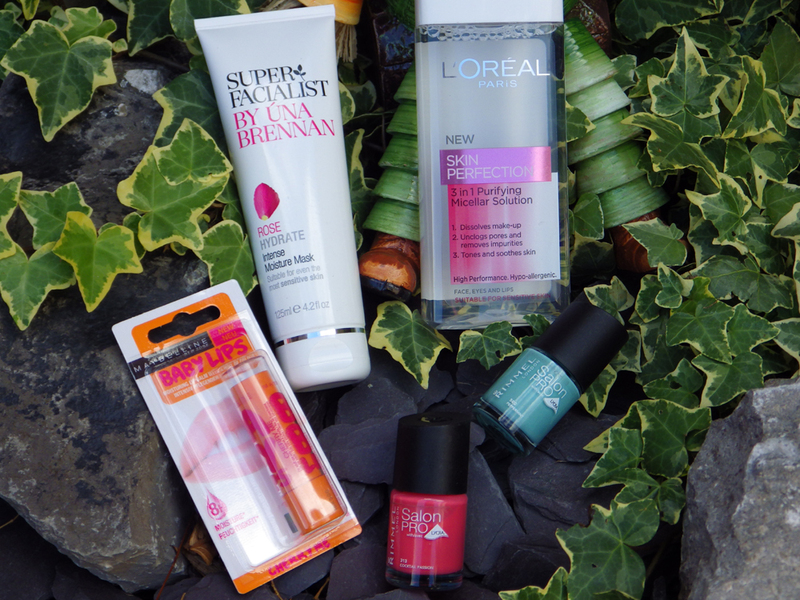 The first items I bought post spending ban was at the recent blogger meetup in London. I do think I was rather reserved considering it was my first opportunity to spend! In Boots I picked up the Bourjois Cream Blusher in 02 Healthy Glow (which I'd been lusting for ages), Revlon Lip Butter in Wild Watermelon (a gorgeous pinky red to ease myself into the world of red lips!) and some Barry M nail varnishes. I grabbed my first Gelly nail varnish in Guava (so beautiful! 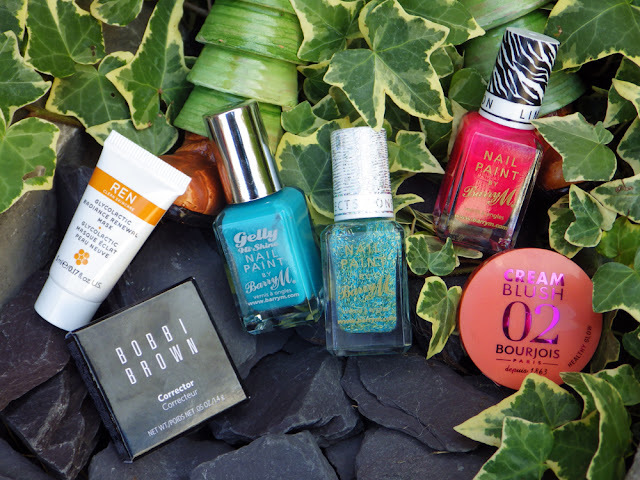 ), the Confetti Nail Effect in Sour Apple (so similar to the Nails Inc one) and the limited edition neon pink varnish (unnamed) came free as I spent over £6.00 on Barry M. We also went to Liberty's where I finally splurged in the Bobbi Brown Corrector in Light Bisque, which is designed to neutralise under eye darkness before applying concealer (will get a review up to let you know my thoughts ASAP!). I also picked up a free sample of the REN Glycolactic Radiance Renewal Mask from the REN counter. Now into the world of skincare from one of my favourite natural/organic sites - Naturismo. I also recently discovered thanks to Angelica from One Little Vice that they sell samples of some fab brands including Elemental Herbology, although you to buy a full size product to be able to order them. 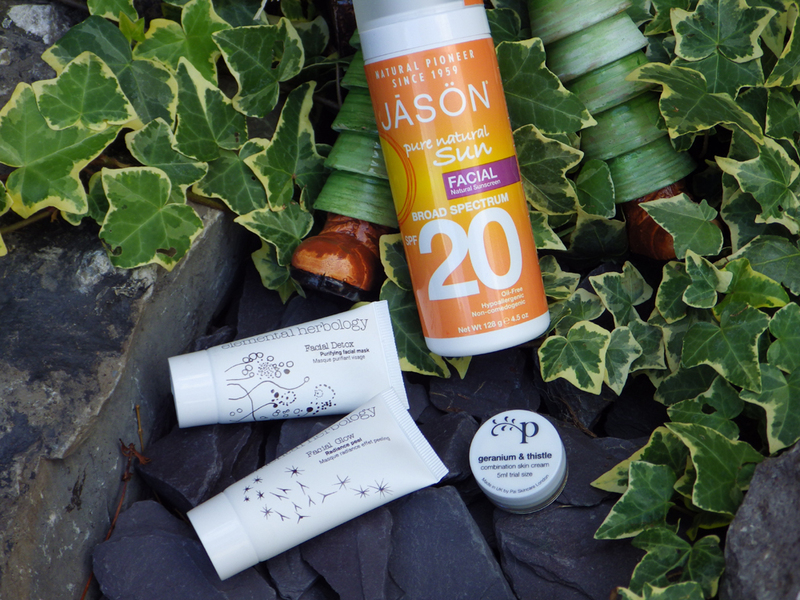 I really need to wear SPF more often, so I ordered up the Jason Facial Natural Sunscreen SPF20 as it was under £10.00 and is non-comedogenic, so won't clog my pores. I then just had to order samples of the Elemental Herbology Facial Detox and Radiance Peel masks, which are both 10ml and cost £2.25 each. I also added to my basket the Pai Geranium and Thistle Combination Skin Cream sample, as I'm being a bit floozy with my moisturisers right now and loved the sound of this. Back to blogger heaven now a.k.a Boots! My local one is quite small so I did an online order, which came to over £20.00 so I got free delivery to store. I've used this service before and delivery to store is really quick - only a couple of days. The L'Oreal Micellar Water was on offer and seemed like a purse friendly way of trying my first micellar water. Skincare wise I also bought the Superfacialist by Una Brennan Rose Hydrate Intense Moisture Mask as again, it is purse friendly (£8.99) and I've wanted a hydrating mask for my collection for ages. Of course I had to get a Maybelline Baby Lips and chose Cherry Me, which is the one I've liked the most from online swatches. To get the order over £20.00 for free delivery I ordered two Rimmel Salon Pro nail varnishes, which were buy one get one half price. I picked the absolutely gorgeous shades Peppermint and Cocktail Passion. Now I'm not an obsessive fan girl (though I do love a bit of a sing-a-long/boogie to 1D) but I picked up the MUA 1D Kiss You Lipstick in Niall "Moments". It's such a pretty pink shade with a hint of glitter. Lastly, using the 20% discount code from Red magazine I finally caved and bought the REN ClearCalm 3 Clarifying Clay Cleanser. However as of publishing this post it hasn't yet been delivered! It will also come with two free samples as with every REN order - I chose the Purity Cleansing Balm and another of the Glycolactic Radiance Renewal samples. I know I haven't really touched on what I think about these products themselves, but this post would be seriously long if I did! I will do full reviews in due course. What beauty purchases have you made recently? Great haul! You will not be disappointed with Una Brennan mask - it's great! Oh everything looks scrumptious. Way to treat yourself after a successful spending ban.